To many, the concept of the contact sheet is one of irrelevance; an artefact of the past; proof of photographic creation from another age. But to Grant Scott, the contact sheet holds more relevance today than it has for many years. He put his personal theories concerning the contact sheet to Kristen Lubben; associate curator of the International Centre of Photography, New York, and editor of Magnum Contact Sheets. It would be true to say that there is no shortage of books currently available, which have been culled from the extensive Magnum Photos archives. The themes that hold these collections together seem endless; the reasons behind each release seem to be ever more tenuous. But every once and a while a book comes along that makes you stop, look and listen. 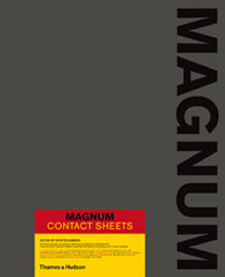 Magnum Contact Sheets is such a book. It is a serious tome (a description I use based on its size, weight and design; all of which are imbued with serious intent). Its content is extensive, exhaustive in its research and inspiring. It is a book which in content and structure reminds me of the classic Appearances: Fashion Photography Since 1945 by Martin Harrison which, when published in 1991, ignited a renewed interest in work and photographers that had largely been forgotten and consigned to the rarely-opened archival plan chest drawer. But that was then and this is now, and 2011 is a digital age in which the contact sheet has become an historical relic imitated within software packages, and the plan chests have been long removed to be replaced by external hard drives and servers. So is this book an epitaph for an age gone by, or an inspirational volume for what is to come? I know which of these two options I believe, and speaking with Kristen it soon becomes clear that this is a book which may be more important to today’s image makers than any other currently available. Kristen: When I came to this project the basic structure of the book had been decided by Magnum and the publishers. It had been decided that all of the photographers’ work would be analogue, and that we would not include digital work. Martin Parr had been very involved in the conception of that framework and what the parameters would be for the project. I quote him in the introduction as saying that he sees the book as a kind of an epitaph for the contact sheet. I think that the non-inclusion of digital work within the book is a critical distinction to make about it. For him it was to be about a change of materials and a change in a way of working. It had also been decided that the photographers and editors would make the initial cut of their work for inclusion; not as a final decision but as a series of starting points. Grant: Editing is an art form in itself, which many photographers spend a lot of time engaging in. However, it is a widely recognised fact that many photographers are the worst editors of their own work. They also often believe that their latest shots are their best; whether they are or not. Kristen: Exactly. The issue is getting them to understand that what they are most excited about, or are currently working on, does not necessarily show their work at its best. Some photographers are extremely particular about their work; especially when it comes to their contact sheets. By showing them, the photographer is not showing the finished print or their selected image, but the things that they didn’t want to show initially. Grant: A contact sheet bares the soul of a photographer. Kristen: Right. You are opening yourself up to the peanut gallery of people dissecting your work. Whether it was a lucky shot – which you could also describe as the decisive moment – or being quick on your feet; there is definitely a letting go of control when you let people see the way you work. There is a great quote by Elliott Erwitt about the moment of looking at a contact sheet when you have to contend with the reality of what you’ve captured. You have your hopes and intentions about what you are striving for, but then you have to sit down with a contact sheet and a loupe to deal with the reality of what you have actually captured. Grant: That brings me round to the fact that editing can be broken down into two separate processes: the art of editing in camera, and the art of editing the captured images; two art forms that are very difficult to teach and are often undervalued. Kristen: And which are in flux now, as the whole process of editing is changing, because the images which now surround us are being digested in a very different way. Photographers now edit their own work in the field and upload only the images they believe to be right, therefore cutting out the role of the photo editor; a role which, at the height of photo magazines in the middle of the 20th century, was so huge and important. Today everything has changed in the way in which images are captured and edited, and the stories that are told around them. Grant: The commercial edit has also now become dependent on speed, and there is less time for a photographer to live with a set of images before making decisions. Kristen: I still don’t know if that’s the nature of the new medium, or whether there is a way to spend more time with digital images; to sit with them and digest them. Chris Anderson’s contact sheets of images from Afghanistan contain the marked circle around the image he chose for its newsworthiness at the time, which was used in magazines around the world. It was only in subsequent years, when he returned to the sheets, that he saw another frame, which to him was much more symbolically meaningful about the war. It’s that process of being able to go back and re-edit your own work with a different eye, or purpose. Grant: Also, with the hindsight of history. Kristen: Right, it’s true, and out-takes can also tell us so much more about images that we already know. For instance, the rediscovered out-takes of Robert Capa’s The Falling Soldier have helped us to establish the location for that image. Images that appear to have no use at the time they were created can take on much more importance with the passage of time. Grant: They become historical artefacts, almost separate from photography, because the marks, which the photographers make on the contact sheets, bring a sense of the inner workings and thoughts of the photographer. We see how they view their work at the moment it was created. Kristen: Right. I think it calls to mind how intimate and personal contact sheets are, like a sketchbook. They also have this tactile quality and bear this physical proof of their history. Grant: At the beginning of our conversation you mentioned that Martin Parr felt that this book is an epitaph for analogue photography, but I believe that we are now in a new landscape of image making in which both moving and still images are created by a new world of image makers working in both areas. I often use the concept of the contact sheet as an example of the small step from a series of stills to a series of stills that become a movie. A contact sheet is a storyboard. Kristen: Absolutely. It’s a bridge. Grant: Exactly. I think ‘bridge’ is the perfect word to describe it. Kristen: These are not separate technologies in any way; they are completely united. But I think Martin’s use of the word ‘epitaph’ was more about, if you just look at still photography in isolation, it is an epitaph on a way of working and a way of record keeping. So in that way it is ending. But you’re right, there are still things about it, both formally and structurally, which make the link with filmmaking very apparent. Grant: I do think that the Magnum Contact Sheets book you edited is really important in this context, because it further emphasises the importance of narrative to both photographers and filmmakers. Narrative has always been intrinsic to the still image, and it is of course a vital ingredient in filmmaking. Kristen: I think that’s an excellent point. If it draws people’s eyes to the possibilities of narrative, images in sequence and images in storytelling, then that would be a fantastic outcome. Then it would be less about the end of an era and more about bridging into new possibilities. It’s impossible to look at these contact sheets and not think about their relationship to cinema and the way in which photography and filmmaking have been falsely divided from each other. Grant: There is a small number of photographic books which are compilations of work, which I feel when published ignite a new interest in forgotten photographers’ work, and I think this book could be included in that number. Kristen: What I found interesting about the book in that context was the decision to structure it chronologically, rather than by photographer. By looking at it chronologically, not only does it become a history of photojournalism and Magnum, but you can also see people in the context of their time. Grant: The book definitely offers an insight into how photographers work and think. In a world where it is increasingly difficult to work with, and learn from, established photographers, I think that this is about as close as you can get to one-to-one tuition. Kristen: I do think there is nothing more constructive than sitting down and tracking through their process. It’s like being able to go through someone’s sketchbook; in fact, it is actually more vigorous than that even. Grant: I think that by looking at contact sheets, quite often you can get to know the photographer in a way that a finished print does not represent. Your perception of the photographer as a person can change. Kristen: Yeah, one of the interesting photographers in this context is Elliott Erwitt. When you look at his contacts you get a sense of how intertwined his personal life is with his professional life. He integrates his own intimate experiences into his work. Grant: I agree. Seeing his contacts made me want to see a whole book of just his. But I really do believe that what you have created with this book is a bridge into a new landscape of image making. Kristen: If that’s your take then I think that’s a brilliant one to make, because there is a tendency to put a nostalgic caste on the contact sheet. Your way of looking at it is more forward thinking. It may also encourage a new generation of image makers trying to find their way through these contacts as something fresh and inspiring, not as something their grandparents did with cameras.